INKin' All Night! : YAY in pink and yellow! YAY in pink and yellow! I hope you aren't sick of seeing my samples yet! As part of the Events Council team, we prepare a business presentation and a display board with 12-15 items to be showcased with all attendees! So I still have a few more things to share!! I believe this was the first card that I made when I sat down! For some reason I was really drawn to the subtle tones of the pink, yellow and gray bottles from the DSP! Probably because the majority of the colors in the paper are so bright and bold and fun, but not necessarily my go to colors. 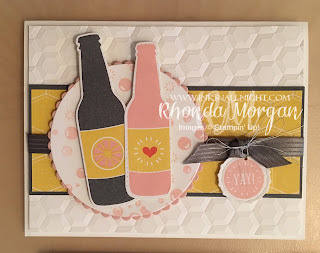 The bottles were my starting point, and that led to pulling in the yellow dsp and a touch of the Basic Gray cardstock layer, and coordinating ribbon. Well from there I pulled in the TIEF embossing folder in the background to go with the pattern found in the dsp! Added some little bubbles and a bottle cap greeting with the YAY stamp! I LOVE, LOVE, LOVE that little YAY and it fits perfectly in one of our circle punches and layers into the Bottle Cap framelit! Anyhow, probably still one of my favorites! Labels: Bubble & Fizz DSP, Bubble Over Bundle, Circle Layering Framelits, Hexagon TIEF, INKin' All Night!, On Stage Live SLC, Stampin' Up! Pizza and Soda Pop Anyone? Online Extravaganza, Flash Sale on Stamps! Getting Ready for On Stage!